All Portlanders might help pay to protect the city from Columbia River floods, if lawmakers vote to authorize a new taxing district covering most of Multnomah County. Oregon lawmakers are being asked to create a new Multnomah County utility and taxing district to shoulder the burden of protecting Portland from raging floodwaters of the Columbia River. 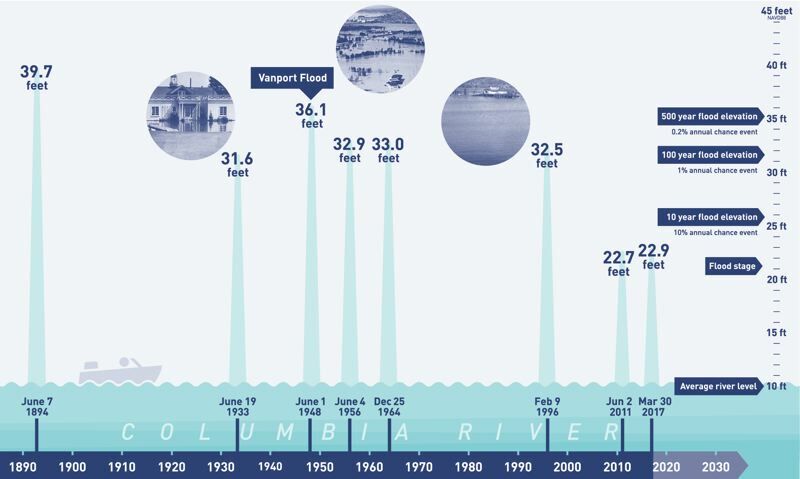 Since the early 20th century, that burden largely has fallen on property owners in the floodplain south of the Columbia River, who agreed to tax themselves to build, maintain and operate a 27-mile network of levees and associated pumps. One of those levees, a railroad embankment doing double duty, failed spectacularly 71 years ago, causing the Vanport Flood that wiped out Oregon's second-largest city. Now those property owners, backed by a large intergovernmental team known as Levee Ready Columbia, are asking the Oregon Legislature to authorize a new flood-control agency for the 21st century. "It's a mechanism to provide long-term flood safety management along the Columbia River to protect the resources behind the levee system and meet federal requirements," said Stephanie Hallock, a project manager for Oregon Solutions who helps coordinate the Levee Ready Columbia project. Property owners — who created four tiny drainage districts decades ago to tax themselves when the area largely consisted of farms — say they can't do it alone any more, especially with a new federal mandate to recertify the levee system's safety. That federal mandate came with stricter safety standards, and the certification is essential for property owners to buy flood insurance. Most Portlanders are unaware that the same railroad embankment that failed in the 1948 Vanport Flood is still doing double-duty as a levee — and recently was identified as the weakest link in the levee system. Replacing it will cost an estimated $15 million to $20 million. The floodplain has been transformed since the days when the drainage districts were created, and the levee system now protects many vital assets: Portland International Airport, the Oregon Air National Guard base that defends the West Coast, the city of Portland's backup water supply, and abundant industrial, retail, hotel, freeway and residential properties. So Levee Ready Columbia, which includes delegates from area cities, the state, business and environmental groups, figures the entire urban part of Multnomah County should be willing to help pay to protect those assets from floods. Portlanders are about to find out whether the Legislature — and property owners on the hook to pay higher taxes — will concur. Lawmakers are being asked, in Senate Bill 431 and House Bill 2008, to replace the four drainage districts with a new urban flood safety and water quality district that covers all of Multnomah County that's within the metro-area urban growth boundary. There's consensus that the four drainage districts are an antiquated way to pay for services that a wider area benefits from, including provisions that limit how much money they can raise via property tax assessments. "We have to stick to the very restrictive strictures that were written into the statute, which is very narrow," said Reed Wagner, executive director for the drainage districts. Initially, some in Levee Ready Columbia wanted to have property owners in the tricounty area pay for levee bond measures. But Metro and the Port of Portland, which have the power to put regional money measures on the ballot, balked. So the organizers went closer to the flood-prone areas, which might be more inclined to fork out money. Multnomah County's Board of Commissioners was reluctant to authorize a countywide utility district, so Levee Ready Columbia turned to the Legislature to authorize one with smaller boundaries. "This is where we could get agreement," said Mike Jordan, director of the Portland Bureau of Environmental Services. The bill submitted to the Legislature is silent on how much money the district could raise. That was intentional, because having the Legislature approve a tax could enable anti-tax forces to refer the bill for a statewide referendum, said Evyn Mitchell, public affairs manager for Levee Ready Columbia. Local advocates aren't in good position to run a statewide electoral campaign on what is mostly a regional concern. Instead, the bill would give district leaders the authority to create a new utility fee for property owners within the floodplain, mostly the same ones who have been funding the drainage districts with property taxes. The district also would be authorized to place bond measures before voters in the urbanized part of Multnomah County. Those bonds are envisioned to pay for some of the big capital improvements needed in the levee system, such as replacement levees and giant pumps that send excess water back to the Columbia River. Levee Ready Columbia leaders say taxes for the bond payments will be modest, and those in the floodplain will continue to pay a much-larger amount to maintain the system. To put the potential $40 million to $60 million bond measure in perspective, Jordan said his Bureau of Environmental Services spends three times that amount each year in capital improvements and maintenance of Portland's sewer and storm management system. But Levee Ready Columbia leaders understand this may be a hard sell. House Speaker Tina Kotek, D-Portland, advised it may take two legislative sessions to pass. That would be OK, said Jules Bailey, a former lawmaker and county commissioner who now is the convener of Levee Ready Columbia. "That works from a timeline perspective," Bailey said. The U.S. Army Corps of Engineers recently got $3 million to do an alternatives analysis of needed levee improvements, and doesn't expect to recommend a slate of solutions until December or January. After that, it may ask Congress to help fund the needed improvements. Those improvements will be essential to get the levee system recertified. Aside from the new taxing authority, jousting has begun over who would control the new utility board, and what its scope might be. The Port of Portland, which operates Portland International Airport and other industrial properties in the floodplain, is lobbying to be a voting member on the board, as the largest affected property owner. The Audubon Society of Portland, which has tangled with the port on development of West Hayden Island and other issues, is adamantly opposed, and wants more community representation on the board. "The way that it's set up sort of perpetuates control by the existing agencies," said Bob Sallinger, the society's conservation director. Levee Ready Columbia proposed a middle position, that the port be given a non-voting member on the board. Sallinger and others are pushing to grant the proposed utility a broader mandate to do environmental restoration and habitat management in the district. To enlist Portlanders to pay for flood control, they'll want to see their money also go to protect salmon, wetlands, water quality and other environmental attributes, Sallinger said. "In order to get buy-in, you're going to have to have a vision that is compelling." Jordan also supports a broader mandate, noting the city already is doing significant environmental work in the Columbia Slough, a series of wetlands just south of the river. But some are pushing to have a narrower scope on flood control, which has been hard enough to fund. Sallinger is concerned that the Army Corps now is in a lead position, and its approaches to flood control often have been "environmentally destructive," he said. The congressional bill providing the $3 million mandates that the Army Corps' main objective is "flood risk management," said Valerie Ringold, chief of the planning and economics section for the agency's Portland district. But the Army Corps will evaluate environmental solutions as part of its four alternatives, Ringold said. While Levee Ready Columbia would welcome federal money to pay for major capital improvements of the system, there's nothing to preclude a short-term strategy to get the system recertified and a long-term strategy that looks at broader environmental goals, Bailey said. Despite some disagreements, "We don't want the levees to fail," Sallinger said. "No one wants another disaster in Portland."